Daktad Suites is a 2-Star Hotel located at Majek Kembo close, off Quarry Road (post office), Ibarra, Abeokuta, Ogun state. It is close to the Nigerian Postal Services office in Abeokuta. Rooms at the Daktad Suites are grouped into the Exclusive rooms, Classic rooms, Elegance Room, Deluxe room, Royal Double, Executive Mini Suite, VIP room, Governor Suite, Daktad Special Suite and the Presidential Suite. 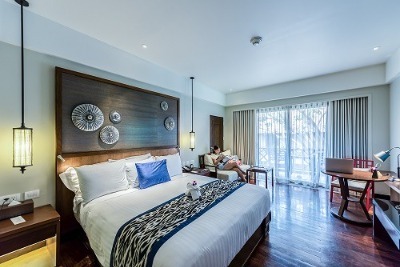 These rooms come with facilities such as telephones, air conditioning, comfortable beds, sofas and centre tables, bedside drawers, private bathrooms with modern bathtubs and shower facilities, study desks and chairs, flat screen television sets with multi-channel cable TV service, and wireless internet connection access. Facilities at the Daktad Suites include an event hall, ample car parking space, regular power supply, excellent security boosted by CCTV cameras and well trained security personnel, restaurant with an array of excellent tasting dishes plus complimentary breakfast service, a bar/lounge with an assortment of diverse beverages, a swimming pool and gym facilities. Laundry, car hire and luggage storage services are also available at the Daktad Suites. Children: Kids under the age of 7 get free lodging. Q: Does the Daktad Suites have a swimming pool? Q: Is there adequate parking space at the Daktad Suites? A: Ample car park space is provided at the Daktad Suites. Q: Is there an event hosting facility at the Daktad Suites? A: Daktad Suites has a spacious event centre fitted with enabling facilities and designed to host a wide variety of events. Q: Are car hire services provided at the Daktad Suites? A: Car hire services are available at the Daktad Suites at an extra cost. Q: Are Internet facilities available at the Daktad Suites? A: Wireless internet connectivity access is granted to guests at the Daktad Suites. Daktad Suites is a budget hotel in Abeokuta, Ogun. I had so much fun at daktard, right from from the pool to the spa to the cinema!!! It was really eventful, so much to eat at the restaurant. Their rooms are beautiful and clean and the environment is so cool and captivating. I look forward to visiting again soon. I was marvelled with their service, it was beyond my expectation. I Love the place. And also thanks to Kate at hotels.ng for your effort concerning my reservation. I would continue using you guys. The environment of the hotel was everything! The hotel had a serene environment and it was very conducive for relaxation. The room was well furnished and the bed was comfortable. The staff made sure I was satisfied with my stay. I enjoyed my stay at the hotel. The hotel had a peaceful and clean environment which was perfect for relaxation. The hotel was well secured. The facilities in the hotel were modern. The bathroom was well equipped and it had in it a water heater. The rooms were properly arranged and comfortable. Have nice pictures of Daktad Suites ?